Kristine Leonard, National Community Life Coordinator for Bethesda Lutheran Communities, talks about National Disability Employment Awareness Month. Learn more about NDEAM at dol.gov/odep/topics/ndeam and find information about wonderful work Bethesda does at bethesdalutherancommunities.org. Rev. 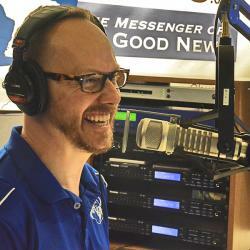 Warren Woerth of Good Shepherd Lutheran Church in Arnold, Missouri, and Andy Bates discuss topics in Creation and dispel myths of the theory of evolution. Rev. Jacob Heine from Christ The Rock Lutheran Church in Rockford, Illinois, studies Matthew 12:38-50. Today’s sermonette is given by Rev. Jacob Heine from Christ The Rock Lutheran Church in Rockford, Illinois. 38 Then some of the scribes and Pharisees answered him, saying, “Teacher, we wish to see a sign from you.” 39 But he answered them,“An evil and adulterous generation seeks for a sign, but no sign will be given to it except the sign of the prophet Jonah. 40 For just as Jonah was three days and three nights in the belly of the great fish, so will the Son of Man be three days and three nights in the heart of the earth. 41 The men of Nineveh will rise up at the judgment with this generation and condemn it, for they repented at the preaching of Jonah, and behold,something greater than Jonah is here. 42 The queen of the South will rise up at the judgment with this generation and condemn it, for she came from the ends of the earth to hear the wisdom of Solomon, and behold,something greater than Solomon is here. Thy Strong Word - Exodus 25: "The Ark of the Covenant"